Lake Manitou is the largest lake of the 108 lakes on Manitoulin Island with a surface area of approximately 104 sq. km or 40.5 sq. miles. It also can lay claim to being the largest lake on a freshwater island in the world. 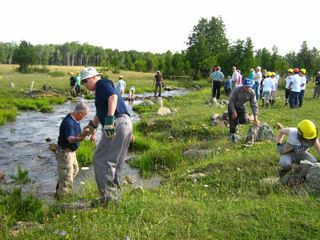 The LMAA has close ties to the Manitoulin Streams Improvement Association, an award winning, non profit organization dedicated to rehabilitating stream ecosystems of Manitoulin Island. The Directors started taking water samples (phosphorus readings) and secchi disc readings (for clarity) in 1993. These water samples (originally sent to London Ontario) are now sent to the Ministry of Environment at Dorset Ontario where records are kept as part of the “Lake partner Program”. These readings continue to be taken annually and will be useful tool in monitoring the water quality of Lake Manitou and any changes that may result due to climate change, development on the lake, etc. Shoal markers were positioned on “Acre shoal” and the “Narrows” during the first year of the associations existence. Since then, additional markers have been placed in other rocky locations around the lake. Thanks to the efforts of member volunteers, these markers are placed and retrieved each spring and fall. Since 1993, the LMAA has been dedicated to educating its lake residents about the benefits of environmental stewardship and sustainable water front living. Early on in the association’s existence, the Manitou River’s headwaters were identified as needing some restoration as it had suffered from many years of neglect. It no longer provided adequate habitat to support aquatic marine life and the spawning beds that were so vital to the sport fishery of Lake Huron were in disrepair. Association volunteers worked a few days each summer for the next three years to remove broken glass and all forms of rubbish from the river. The following year, a Ministry Grant allowed the association to hire a local contractor who provided large equipment as well as boulders & logs necessary to provide fish protection and narrow the river in some areas so the spawning beds could be reclaimed. More recently, association volunteers have been assisted by a number of stewardship partners in an effort to restore perch habitat, and build brook trout spawning beds in Lake Manitou.